Citizen Eco-Drive.We are in 1924 when it is produced in the research Shokosha the first pocket watch. We are in 1924 when it is produced in the research Shokosha the first pocket watch. The hope of the mayor of Tokyo at that time was that this accessory is not considered of great luxury and not affordable for everyone, could become an object common to all citizens. Citizen, translated into our language, means “people” and for this reason the researchers of the institute Shokosha greeted with great enthusiasm to the proposal of the name Citizen expressing very well the concept of making the watch an essential accessory for all and not only a few. Since then it’s been years and Citizen can boast of having achieved its ambitious project pandering to the tastes and needs of all citizens, offering watches with ever more advanced technologies. The novelty in the field of watchmaking, culminated in 1946 when the brand presents a line of watches “ECO-DRIVE” the world’s first solar-powered and artificial, and with a power reserve that varies depending on the model, from 240 days to 7 years. This innovation has led Citizen to be a landmark in the production of watches in the world. Flagship line of “ECO-DRIVE” is the reference clock with AT2020-06A. Jewel complete with wrist chronograph Super titanium, material we know to be 40% lighter of ‘steel. A sports watch with titanium case coupled with a blue rubber strap, white dial with chronograph and date indicators at 4 o’clock. This model features anti-reflective and scratch-resistant sapphire crystal, and has a power reserve of 5 months with a ‘water resistance to 100 meters. 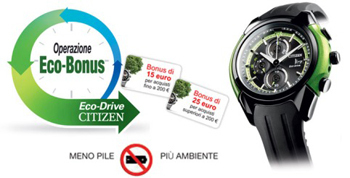 Obviously the creation of Citizen surprise, not only in technology, even at the level of commercial value, because this wonderful model of the line “ECO-DRIVE” is priced at only 238.00 euros.